A beautiful single-ended spray of pink roses and red carnations combined with variegated foliage and palm leaves. Size: 53cm (21"). A classic single-ended spray of white roses, lilies, Eustoma and Gladioli with dark green foliage. Size: 69cm (27"). A classic and natural sheaf of Calla Lilies and complementary foliage tied with a natural bow. Size: 64cm (25"). Open round wreath with natural foliage edge including iris, roses, chrysanthemums and complementary foliage. Size: 31cm (12"). A classic open round wreath of oriental lilies and complementary foliage. Size: diameter 36cm (14"). 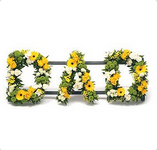 Loose-based letters on stand, including roses, gerberas, chrysanthemums and complementary foliage edge. Size: height 28cm (11") and length 80cm (31"). Based chrysanthemum wreath with spray of red roses and complementary foliage. Size: height 50cm (19.5") and width 48cm (20"). Based letter with Abaca ribbon edging and white orchid spray. Size: height 31cm (12"). Classic white chrysanthemum-based open-heart shaped wreath with roses, complementary foliage and foliage edge. Size: height 38cm (15") and length 37cm (14").